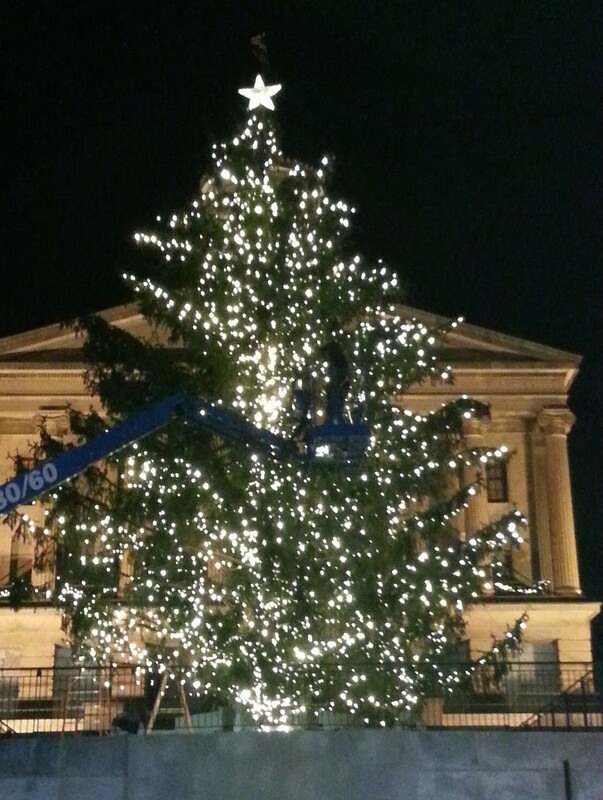 Outdoor Lighting Perspectives of Nashville is proud to be part of Christmas at the Capital for the 3rd year in a row! The giant Norway spruce was harvested from the Cumberland Forest in East Tennessee. It is with great pride that Outdoor Lighting Perspectives of Nashville was asked to light and decorate the capital tree in downtown Nashville this year! This is our third year of being in charge of making the season merry and bright for so many Nashville residents, and visitors alike. This year’s giant Norway spruce was harvested from the Cumberland Forest in East Tennessee and promises to be decked out in its holiday best! 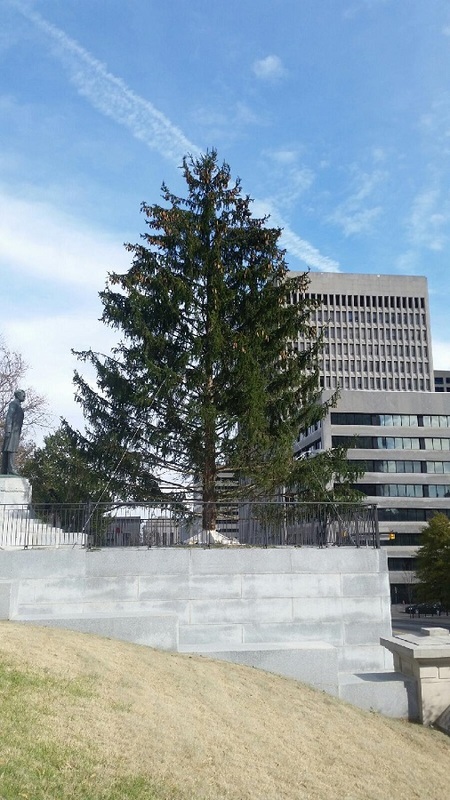 The official tree lighting ceremony is due to take place this evening at 5:30 outside the Tennessee State Capitol where Governor Bill Haslam and his wife, Crissy, will be in charge of lighting the State’s official Christmas tree! Our talented crew busy adding the finishing touches to the state’s official Christmas tree. We were honored to be part of this year’s festivities and hope that everyone enjoys the tree this year! Contact Outdoor Lighting Perspectives of Nashville to learn how we can make the holiday lighting at your home or business just as memorable. Call us at (615) 373 – 0638 and make this Christmas a time to remember and cherish. See more holiday magic with holiday lighting by visiting our holiday lighting gallery located on our website. This entry was posted in Christmas Lighting, Holiday Lighting, Holiday outdoor tree lighting, Nashville Christmas Lighting, Nashville Holiday Lighting, Nashville holidays and special events, Outdoor Lights Nashville and tagged Christmas lighting Nashville, Cumberland Forest, East TN Christmas tree chopped for Nashville ceremony, Lighting the capital tree in Nashville 2014, Nashville capital tree lighting ceremony 2013, Nashville Christmas Lighting, Nashville holiday lighting, Nashville special event holiday tree lighting, Nashville TN holiday lighting design and installation, Outdoor Lighting Perspectives of Nashville chosen to light the 2013 TN capital tree, Tennessee State Capitol Christmas tree 2014, TN Governor Bill Haslam by outdoorlightingnashville. Bookmark the permalink.